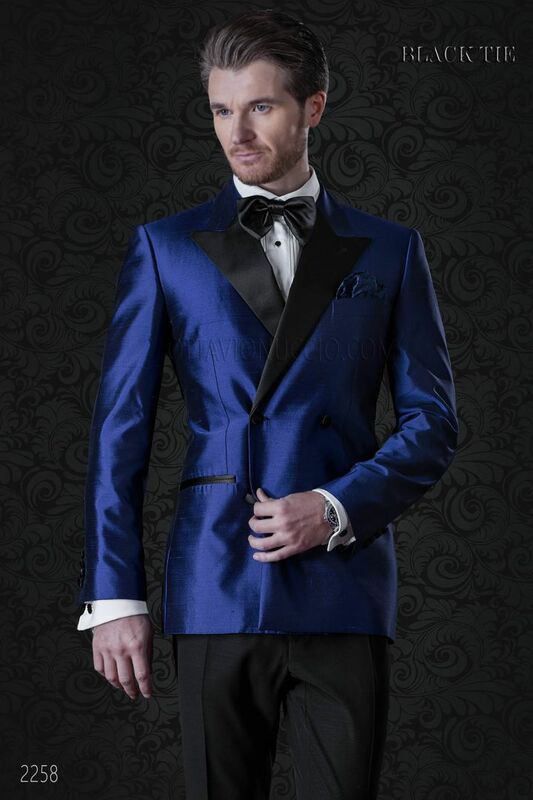 Double-breasted tuxedo jacket in electric blue shantung silk. Wide peak lapel in contrast, 2 jet pockets in contrast, no... Double-breasted tuxedo jacket in electric blue shantung silk. Wide peak lapel in contrast, 2 jet pockets in contrast, no vents at back to better wrap hips . 4 covered buttons in contrast on the front with straight buttonholes, 3 covered buttons in contrast for each sleeve and rounded finish. Rounded finish to stylize the figure and tail of jacket suitable for any height.